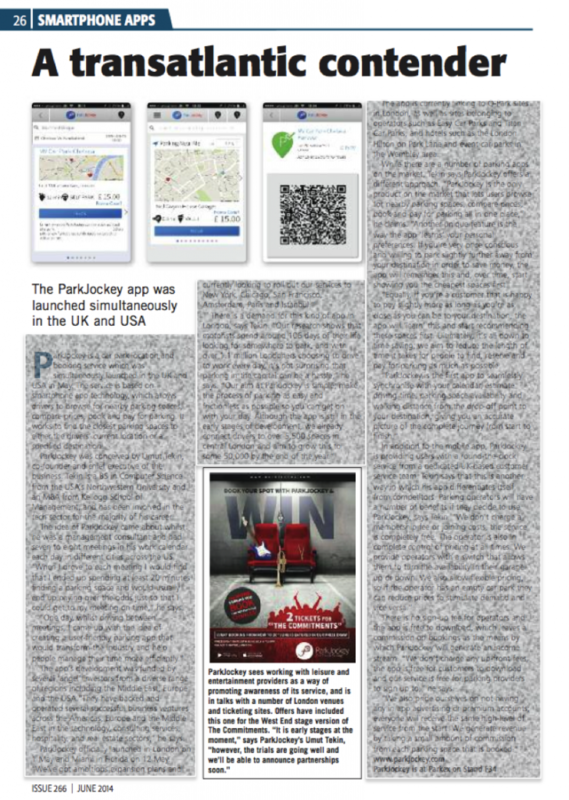 Today, a top parking industry magazine published a enthralling full page article for their June 2014 issue, exhibiting ParkJockey in their ‘Smart Phone App’ section as a transatlantic contender to car park location and booking services. The Parking Review is the UK’s leading parking publication therefore an established reference point to all in the industry. Getting such great exposure is something to be proud of, we take pride in from any mention we get, as it pushes us to strive for more. If you would like to read the full article please subscribe to The Parking Review, you can do this from following this link. This entry was posted in London, ParkJockey, Press and tagged mobile app, Parking Review on May 29, 2014 by ParkJockey Team.